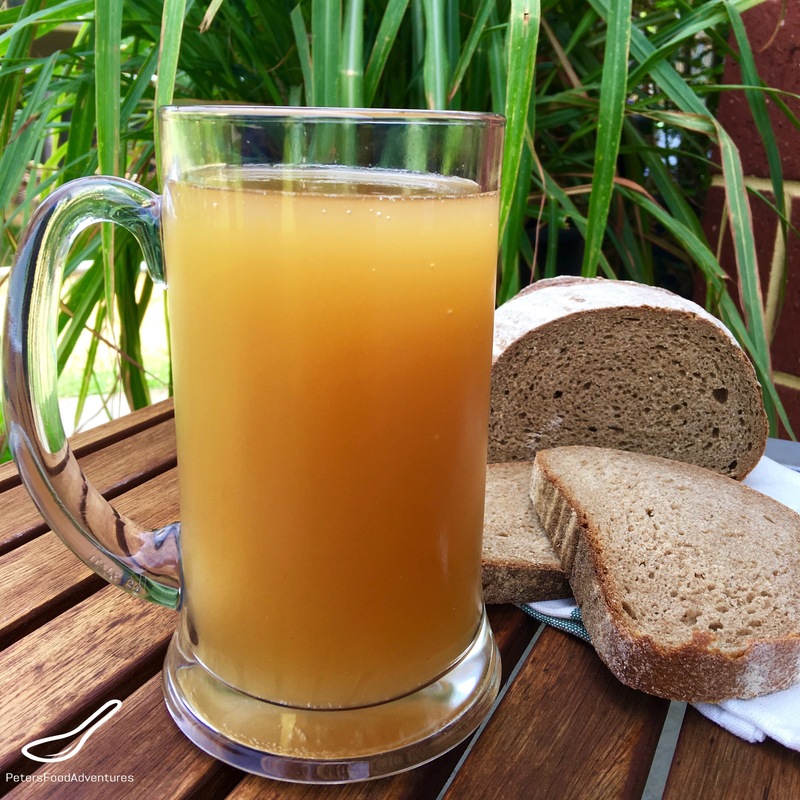 Russian Kvass Recipe (Квас) or Kvas is a refreshing fermented drink that is usually made from Rye bread. It’s popularity is almost like a version of Russian Coca-Cola that has been drunk for hundreds of years in Eastern Europe. It’s classed as a non-alcoholic drink, and usually contains about 0.05% alcohol, like your de-alcoholized beer in the grocery store. It’s also used in Russian soups, such as Okroshka. It was said that the peasants drank more Kvass than water. The process is quite commercialised now, where you can buy Kvass in the grocery store, next to Pepsi. However it just doesn’t taste as good as the home brew. Is All Kvass the Same? There are different types of Kvass recipes. I’ve made a naturally fermented recipe from beets which is incredibly healthy and full of probiotics. You can add different fruits to Kvass, honestly it can be made with almost anything. Rye Bread and Beets are the most popular Kvass recipes, but you can ferment anything. There are some scary inventive recipes out there. Be careful what you try! Rye Bread Kvass has added brewer’s yeast, but Beet Kvass ferments naturally and bubbles from the lacto-fermentation. My Russian Kvass recipe recommends that the bottled Kvass to sit in the fridge for 3 days for better flavor, but you can drink it right away if you like. It tastes better the longer it sits before you drink it. Check out my Beet Kvass recipe. Russian Kvass has been a traditional summer drink, although nothing would stop you from making it in the winter. In Soviet times, there was a large ‘barrel’ of Kvass on wheels that people would line up to buy a glass of Kvass, sometimes drunk from a communal cup. Thank goodness that doesn’t happen anymore. In Russian, Kvas has 4 letters, which literally spell K-v-a-s phonetically. I am completely at a loss at the extra letter S in the english translation kvass. Maybe I should stop whining about the phonics, and pour myself another cold glass from my traditional Russian Kvass recipe. Bon Appetit! Приятного аппетита! When the water is boiled, remove from heat. Add the toast to the boiling water, cover and allow to cool (better to leave overnight). Strain the toasted bread using a cheese cloth. The kvas will be cold at this moment. Quickly warm up the kvas on the stove, until it is warm and around 35°C/95°F. Don't use water hotter than 45°C/110°F, or it will kill the yeast. If the water is cold, the yeast won't activate. Remove the warmed Kvass off the heat. Add the yeast, sugar, honey and 1 teaspoon of raisins and allow to sit for 6-8 hours. Stir to make sure the sugar and honey are fully dissolved. You will see foam and bubbles start to rise in the kvas. Strain the kvas using a cheese cloth. Put 2-3 raisins in each soft drink bottle and pour the kvas and seal tightly. Only fill the bottle about 2/3 of the way, squeezing the sides letting air out, as it will continue to ferment and expand in the fridge. The next day, when the bottle is too tight, open it to release some air out, and squeeze again. After about 3 days in the fridge, your kvas is ready to enjoy! How interesting! I have never heard of this. Thank you! No worries! Thank YOU for checking it out! Homemade is so much better than the store bought versions, maybe I just like it sweet! Definitely a new one for me! I was going to make your kvass but the rye bread I have is loaded with caraway seeds. Is that going to make the kvass funky? Thank you! Caraway seeds sounds interesting. I’ve never made it with caraway rye, however I think it would make the flavour more interesting. There’s always a chance it will be so subtle, you won’t even notice it. Give it a try, and let me know how it went! ???? I drank Kvass recently in Russia and loved it, especially in soup. You’ve made me see it’s not that hard to replicate at home. I’ll be trying it for sure. Thanks! Thanks so much for checking it out! Be sure not to use a Kvass that’s too sweet! ???? When you say leave for 6-8 hrs….is that on or off the heat?